Bermuda, December 1953 – Three of the worlds most powerful meet to discuss the future of relationships with post WWII Russia. At the request of British Prime Minister Sir Winston Churchill, President Dwight D. Eisenhower and French Premier Joseph Laniel joined him on the Island for the Three Power Talks, as the meeting would come to be known. Churchill enjoyed many fine cigars during this meeting. Fortunately, one of those cigars, partially smoked by Sir Winston himself still exists today. This cigar was recently purchased at auction, along with a letter of provenance from the Royal Welsh Fusilier soldier who rescued it after the summit. We are honored to announce that a portion of this original cigar was offered to PAYNE-MASON to use in the creation of a new cigar unlike any other. PAYNE-MASON’s Master Rollers carefully researched the blend of the original cigar, created by the long since closed La Aroma de Cuba, and recreated it as closely as possible using the aged, premium tobaccos found in other PAYNE-MASON cigars. To this already one-of-a-kind creation, we have meticulously added a small portion of the original tobacco from Sir Winston’s cigar. 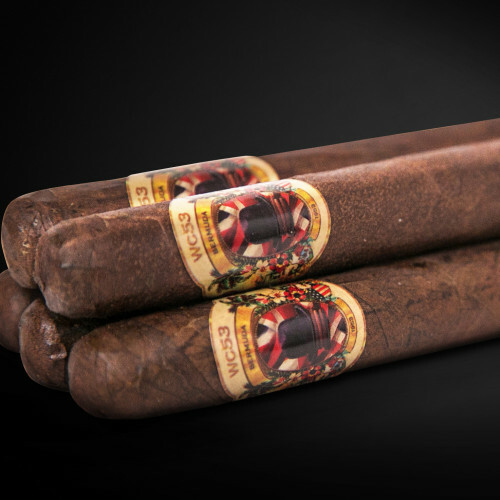 We have named this new cigar the WC 53 in honor of Sir Winston Churchill and the year of the original meeting, 1953. By carefully researching the original cigar personally smoked by Churchill, our own team of Cuban Master Rollers was able to discover the unique blends and rare tobaccos used by the boutique Cuban cigar manufacturer, La Aroma de Cuba, long since closed, to craft the original. From these discovered recipes, PAYNE-MASON was able to recreate a uniquely similar cigar, using a new proprietary blend of tobaccos with characteristics found in the original, in combination with equally unique tobaccos not found in todays commercial cigar market. To further enhance the uniqueness of this already one-of-a-kind creation, we meticulously added a small portion of the actual, original tobacco from Sir Winston’s cigar. A new, stunningly beautiful cigar band was commissioned just for this project and evokes the tropical atmosphere, the importance of this world changing event, and Churchill’s love of cigars. This limited edition and numbered WC53 Commemorative Gift Set includes one WC53 “DNA” CIGAR, featuring Sir Winston’s original cigar tobacco, presented in a handcrafted hardwood glass top display box, with a plaque explaining the provenance. With the creation of the WC53 DNA came the opportunity to feature a unique blend with the authentic flavor characteristics of Cuban Cigars of the 1950’s. The WC53 SMOKER, a new cigar 100% hand rolled by our own Cuban Master Rollers, provides an opportunity to travel back in time and once again experience the national heritage of Cuba. Contains 10 of the WC53 Smoker cigars, crafted from the same new blends and premium tobaccos as the WC53 DNA, but without the original donor tobacco. The WC53 Combo is a two item set containing both the solid mahogany, glass topped tomb box containing one iconic WC53 DNA cigar (featuring actual tobacco from one of Sir Winston Churchill’s personal cigars), as well as a hardwood gift set containing 10 of the WC53 Smoker cigars, crafted from the same new blends and premium tobaccos as the WC53 DNA, but without the original donor tobacco. VIEW THE ENTIRE WC53 LINE.